Momofuku calls this a sleeper cookie, that is, one that they did not expect would be that popular but has become a favorite. 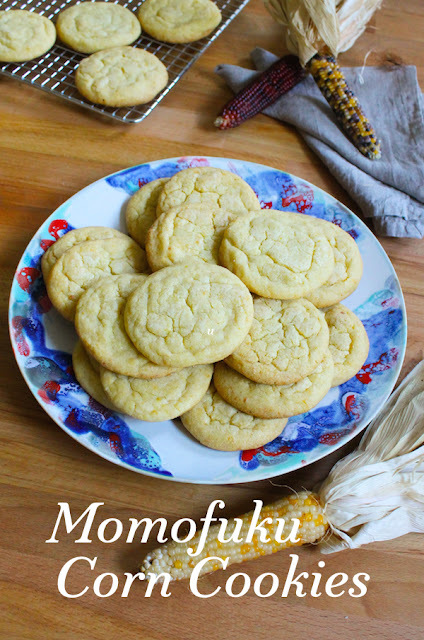 Rich, buttery, sweet but a bit salty, these Momofuku corn cookies are chewy and completely more-ish. One of the beautiful things about having children is the intelligent discourse that becomes possible as they grow and become more articulate. Nothing gives me greater pleasure than spending time with my girls and learning from them. This past week I was in Baltimore visiting our elder daughter and I had the best time exploring her neighborhood and talking with her late into the night. We ate lump crab cakes at Faidley’s in the world famous Lexington Market, bought pasta puttanesca supplies and chianti at a little Italian grocery for dinner on Friday night and enjoyed a beautiful meal – with house brewed beer, of course – at The Brewer’s Art. We even got to cheer on the runners in the Baltimore Marathon which ran right through her neighborhood Saturday. On my final night, we brought home boiled crabs for dinner from Lexington Market. And if it sounds like all we did was eat, eat, eat, well, I cannot deny that. But we also managed to get our work done and we talked a lot. I mentioned to her that I wasn’t going to take part in this cookie event because time had gotten away from me in Houston and I hadn’t had time to bake. Her eyes lit up at a good reason to introduce me to these Momofuku corn cookies, which she had already made twice in as many weeks. She extolled their virtues at length and, best of all, had the ingredients in the cupboard already. How could I resist? 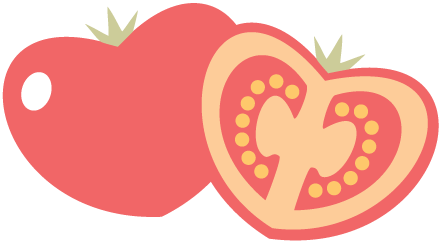 I need to introduce the recipe by saying that we got it off the Lucky Peach website and it supposedly comes from the Momofuku cookbook. I say supposedly because I have never held that volume in my hands. I can tell you the measurements online are off so I hope that they are correct in the book. 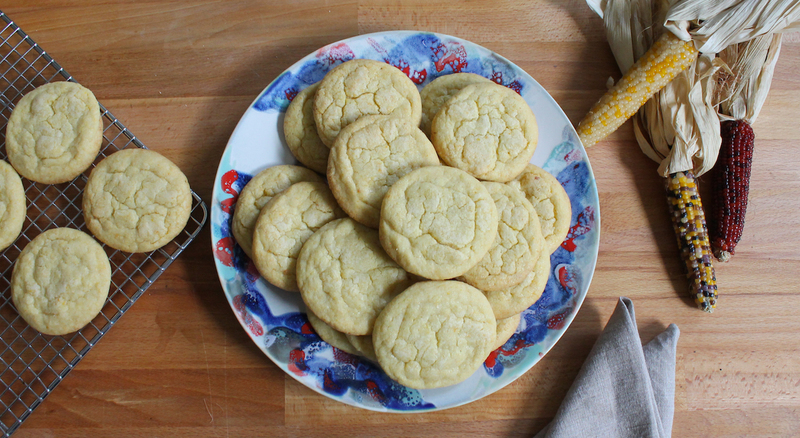 Since my daughter had already made these corn cookies twice, she said to ignore the volume amounts and use the weight measurements. I followed her instructions and give you below the corrected volume measurements for those who don’t have a digital kitchen scale. 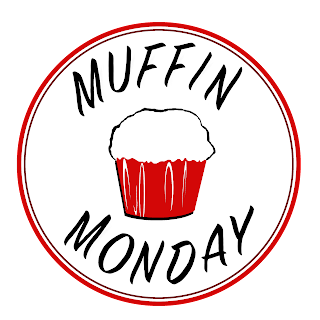 *Note: I used Karen’s Freeze Dried Corn (<affiliate link) in this recipe, weighing out 65g and then blitzing it into powder with a food processor. The resulting powder measured about 1/2 cup by volume. 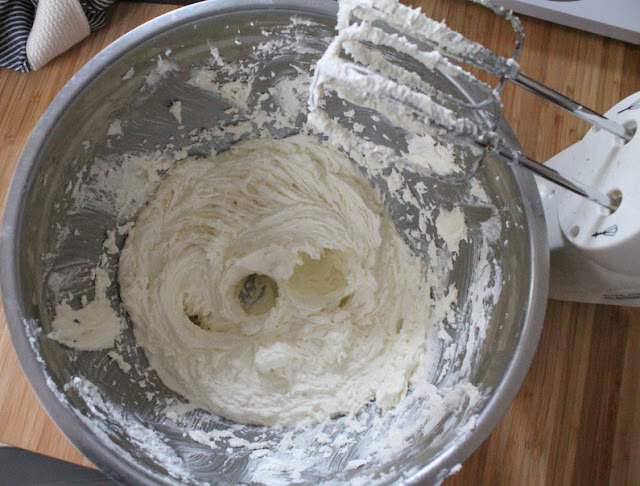 Use a stand or handheld electric beaters to cream the butter and sugar together on medium high until they are fluffy and pale yellow, about 2-3 minutes. Add in the egg and mix it in with the beaters on low. Increase the speed to medium high again and beat for eight minutes, scraping down the sides of the bowl occasionally with a rubber spatula. Here the original recipe says that at the end of eight minutes, the sugar will be dissolved completely and the volume would double. Neither was true of mine but, honestly, it did not matter. The butter, sugar and egg were very pale and fluffy and I called it good. 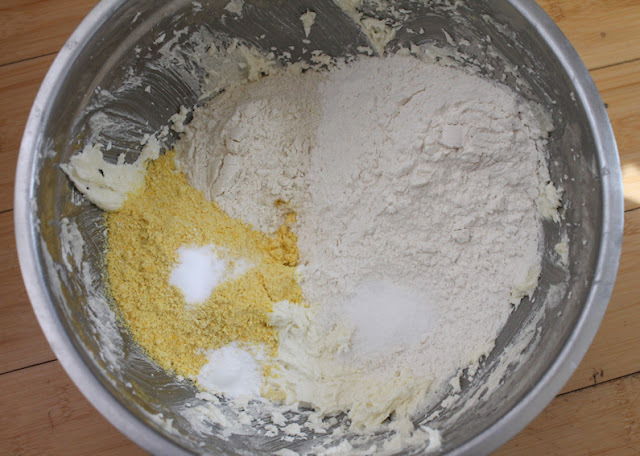 With your mixer or beaters on low, mix in all of the dry ingredients, just until they come together as a dough. 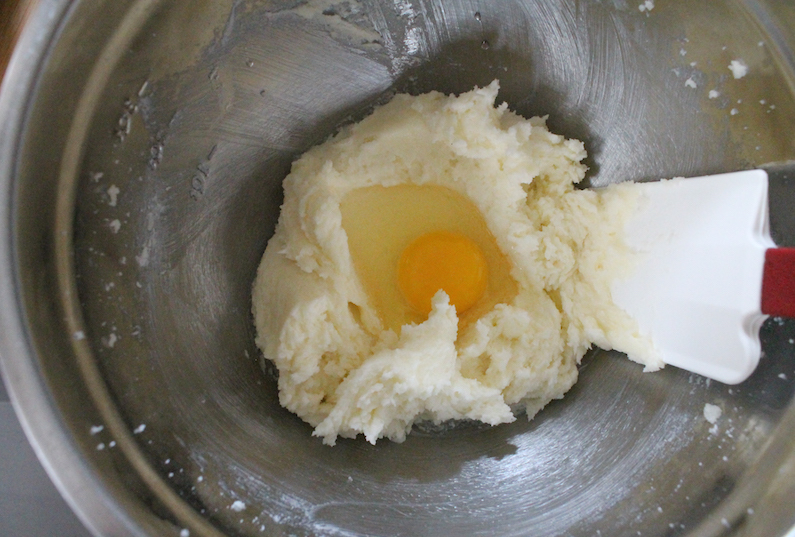 Use a scoop or two spoons to divide the dough into 24 relatively equal portions. If you are a scale-using person, mine were about 40g each. 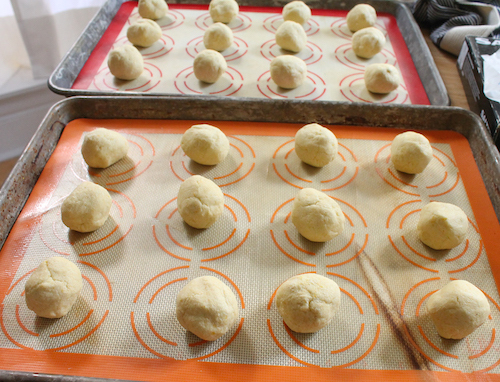 Using clean hands, roll the dough into balls and place on two cookie sheet lines with baking parchment or silicone liners. Chill in the refrigerator for one hour. You can chill these for longer, even overnight, but in that case, cover them with cling film so they don’t dry out. The chilling time is a must for cookies with this much butter. 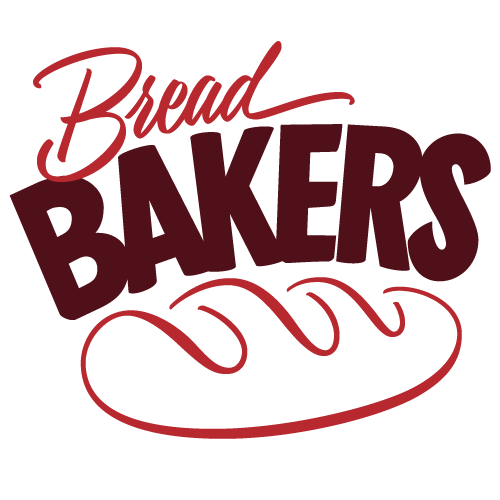 If you bake them without chilling, the butter will melt out. As you come to the end of the chilling time, preheat your oven to 350°F or 180°C. Bake the cookies one pan at a time on the middle shelf of your preheated oven, leaving the second pan in the refrigerator until you are ready to bake it. Bake for 10 minutes and then turn the pan around to make sure the cookies bake evenly. 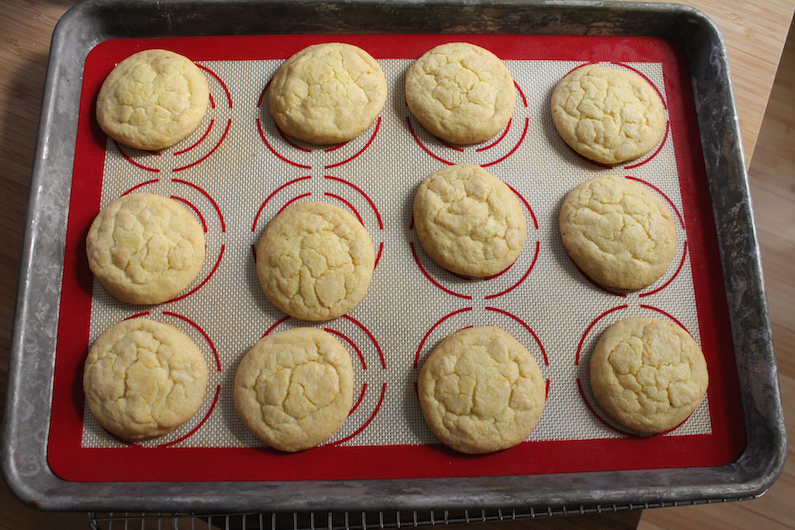 Bake for a further 5-6 minutes or until the edges are slightly golden and the cookies are a bit puffy looking. They will sink when they start cooling but that’s okay. Leave the cookies to cool on the pans for a few minutes then cool them completely on a wire rack. I wish I could adequately describe to you the buttery, chewiness of these sweet and salty corn cookies. 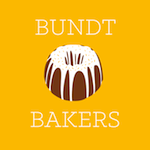 Let me just say that you should try them, and as soon as possible. As you can see, when they are just turning brown on the edges, they are lovely and golden on the bottom. 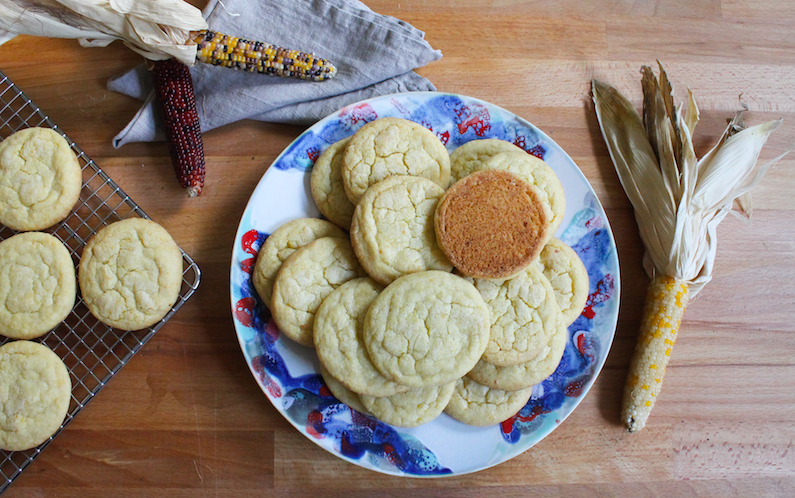 This month my Creative Cookie Exchange group is baking with the tastes of autumn. Check out the lovely list of cookies we have for you today.